Spectacular custom built bungalow on rare 68’ x 114’ corner lot in prestigious Westbrook Meadows. Featuring over 3,000 sq/ft of finished living space, 2+2 bedrooms, 3 full baths and American Cherry hardwood and tile flooring throughout the main floor. 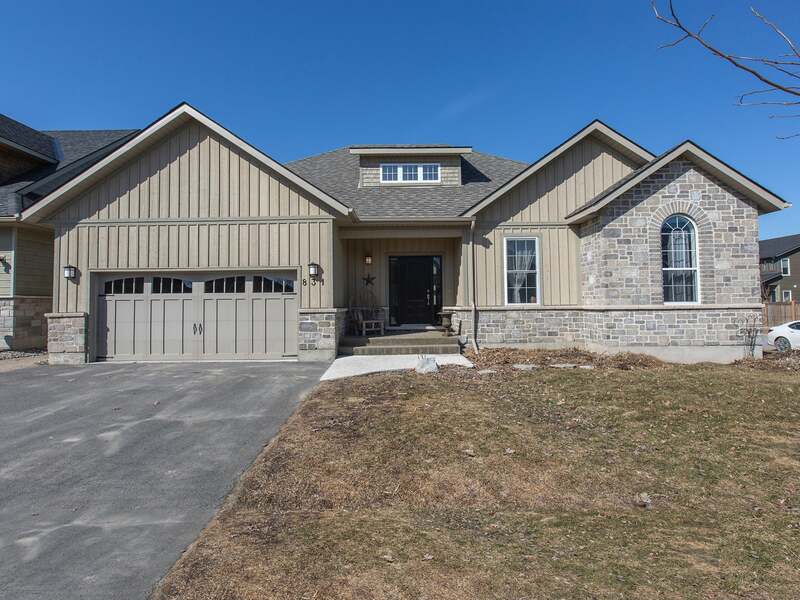 Two storey foyer w/slate tile leading to bright living room with vaulted ceilings, linear gas fireplace, pot lighting and huge windows open to the stunning custom kitchen with cabinets to the ceilings, large island w/quartz counters, apron sink, glass inserts, gas range and walk-in pantry. Large dining room w/patio doors to covered rear deck w/gas BBQ hook-up. Master bedroom offers patio doors to 2nd deck, gorgeous ensuite with freestanding soaker tub, tile & glass shower and walk-in closet. Main floor office w/closet (could be 3rd bedroom) plus main floor laundry room. Fully finished basement with large rec room, 2 bedrooms, r/i for future wet bar, 3-piece bathroom and more. High efficiency dual zone furnace w/air cleaner, central air, HRV, central vac, insulated garage with gas r/i for heater. A carefully thought out and well built home, a must see! Lot Size 68 x 114 Sq. Ft. Please send me more information on 831 Kananaskis Drive, Ontario. Thank you.